In previous post I described how to create a simple PowerShell scripts that is capable of installing a software starting from a zipped file that contains the “release” of a software (produced by a build) and some installation parameters. Once you have this scenario up and running, releasing your software automatically is quite simple. Once you automated the installation with a PowerShell script plus an archive file with Everything is needed to install the software, you are only a step away from Continuous Deployment. 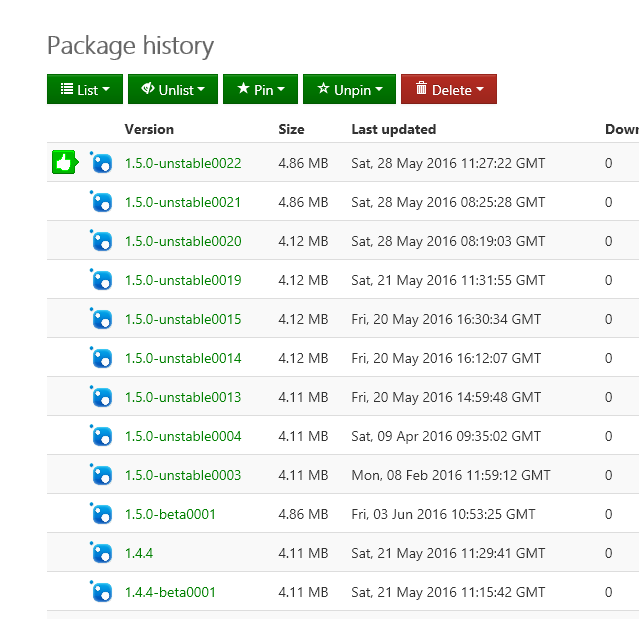 A possible release vector is Chocolatey, a package manager for Windows based on NuGet. I’m not a Chocolatey expert, but at the very basic level, to create a chocolatey package you should only have a bunch of files and a PowerShell script that install the software. The most basic form of a Chocolatey package is composed by files that contains artifacts to be installed and a PowerShell script that does the installation. The very first step is creating a .nuspec file that will define what will be contained in Chocolatey package. Here is a possible content of release.nuspec file. The real interesting part of this file is the <files> section, where I simply list all the files I want to be included in the package. ConfigurationManagerSetup.ps1 and JarvisUtils.psm1 are the original installation script I wrote, and Jarvis.ConfigurationService.Host.zip is the name of the artifacts generated by the PackRelease.ps1 script. To support Chocolatey you only need to create another script, called chocolateyInstall.ps1 that will be called by chocolatey to install the software. This script is really simple, it needs to parse Chocolatey input parameters and invoke the original installation script to install the software. Write-Output "Installing Jarvis.ConfigurationManager service. Script running from $PSScriptRoot"
Write-Output "installationRoot Argument Found: $installationRoot"
Write-Output "No Package Parameters Passed in"
Write-Output "Installing ConfigurationManager in folder $installationRoot"
Throw "Unable to find package file $artifactFile"
Write-Output "Installing from artifacts: $artifactFile"
Throw "Unable to find package file $PSScriptRoot\ConfigurationManagerSetup.ps1"
This script does almost nothing, it delegates everything to the ConfigurationManagerSetup.ps1 file. Once the .nuspec file and this script are writenn, you can use nuget.exe to manually generate a package and verify installing in a target system. When everything is ok and you are able to create and install a chocolatey package locally, you can schedule Chocolatey package creation with a TFS Build. The advantage is automatic publishing and SemVer version management done with Gitversion.exe. Figure 1: Task to generate Chocolatey Package. 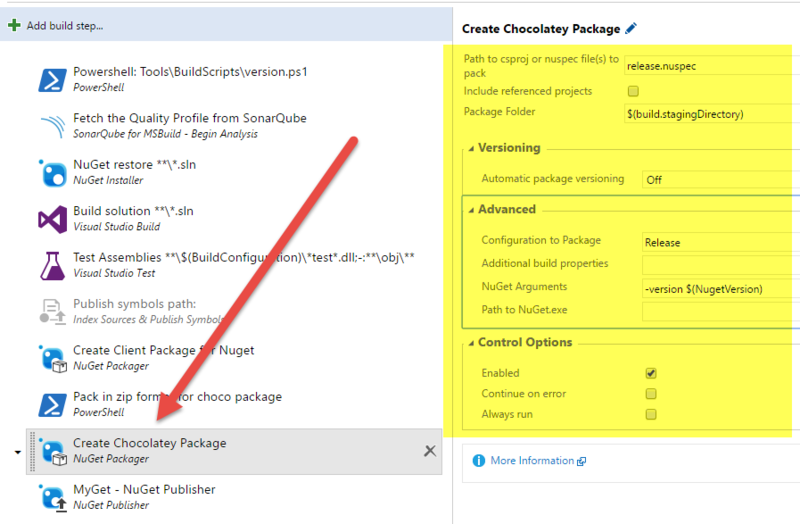 To generate Chocolatey Package you can use the standard NuGet Packager task, because Chocolatey uses the very same technology as NuGet. As you can see from Figure 1 the task is really simple and needs very few parameters to work. If you like more detail I’ve blogged in the past about using this task to publish NuGet packages. This technique is perfectly valid for VSTS or TFS 2015 on-premises. Once the build is finished, and the package is published, you should check on NuGet or MyGet if the package is ok.
All parameters needed by the installation scripts should be specified with the –packageParameters command line options. It is duty of chocolateyInstall.ps1 parsing this string and pass all parameters to the original installation script. If you want to install a prerelease version (the ones with a suffix) you need to specify the exact version and use the –pre parameter. A working example of scripts and nuspec file can be found in ConfigurationManager project. One of the greatest advantage in using Git over a centralized Version Control System is branching system. It is quite common for developers to start branching whenever they need to add a new feature, work on that branch and finally merge back to mainline when the feature is finished. One of the most famous workflow is called GitFlow, a way to work in Git that is implemented even in some GUI tool like SourceTree. 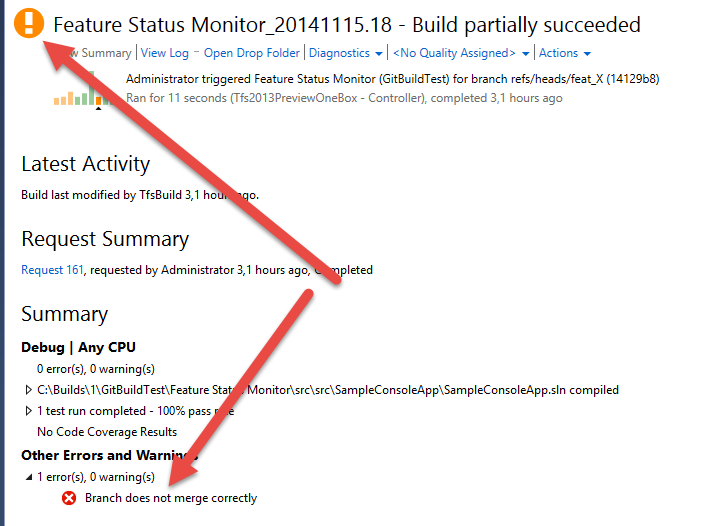 One of the main problem when you heavily use feature branches is the moment you merge back to mainline. One of the technique to easy the pain is periodically do a forward integration from mainline to feature branch, because it is usually easier doing several little merge than doing a big merge when the feature is complete. Even if the branch merge automatically the code wont compile. Even if the branch merge automatically and the code compile, some tests where broken. With TFS Build you can achieve this result quite simply, first of all configure a build with a trigger for each push, then in the Source Settings specify that this build should be triggered whenever any branch that starts with feat got any push. Write-Host "Source folder is $rootDir"
$ps.StartInfo.Arguments = " merge master"
This is really a first tentative in this direction, there probably better way to do it, but it solves the problem without any great complexity. It just uses a regular expression to find branch name from the environment variable TF_BUILD_SOURCEGETVERSION. Once you have name of the branch just checkout it and then try to “git merge master” to merge the branch with master. Quite all git command return 0 if the operation is successful, so if the ExitCode of “git merge master” command is different from 0 it means that the merge operation did not complete correctly (conflicts occurred). If the merge is unsuccessful the script use UI.WriteErrorLine to write error on the UI and this has two effects: first the message will be reported on the Build Summary, then then build will be marked as partially failed. Figure 2: Code does not automatically merge after the latest push. This is a signal that is time to do a forward integration from mainline to your branch, because the amount of conflicts will be probably small. Another advantage is that you can merge the code while your modification is fresh in your mind. Nothing is more painfully than merge code you have written a month ago. If the merge is successfully it does not mean that the code is in good health. Suppose you rename a method in your branch, but in the mainline another one has pushed an increment with another class that uses that method. This is the perfect example of code that gave no merge conflicts, but it does not even compile. Since the script actually does the merge before the build, the rest of the build works on the code result of the merge, now the build fails. In this situation you surely have a standard build that simply works on the feature branch that is green, but the Build System can run for you this another special build that runs on the result of the merge with mainline that is Red. This means: In your branch code everything is green, but when you will merge to mainline you will have problem, so it is probably better to look at that problems now!. The very same happens if the result of the merge breaks some unit test. In conclusion, thanks to few PowerShell lines, you can instruct your TFS build to automatically try to merge each increment of code in your feature branches and then compile, run test and do whatever any operation you usually do on your build on the result of the merge between the feature branch and mainline. Thanks to this you can immediately merge from mainline to your branch to fix the problem as soon as you have introduced it. This approach has some disadvantages. First of all a PowerShell script cannot make the build fails, so if the code does not merge, usually you will have a failing build because the build system try to build source code during a merge and find invalid characters in source code. Second, this special build runs only when there is a push on some feature branch, but nothing happens if someone pushes in the mainline. In that case you should run this special build for every feature branch you have in your repository. Using DPAPI to encrypt password in builds suffers from a serious drawback, the password can be decrypted only by code that runs on the very same computer used to encrypt the password. You can overcome this limitation using roaming profiles, but it is not a option in many scenario. Another technique to enable multiple build servers to decrypt a password is using certificates. In PowerShell is really easy to use a certificate to encrypt/decrypt string and this article will show you how to secure a password in TFS Build definition using Certificates. This command creates a certificate in your certificate store. To view it you should type certmgr to open the Certificates Manager Console. Your newly created certificate should now appear in the list of certificates. Figure 1: Your newly created certificate appears in certificate store. 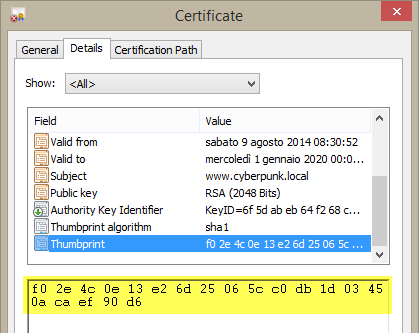 Double Clicking the certificate opens detail windows where you can find the value of Thumbprint property (Figure 2). This property is useful because it uniquely identifies this certificate in certificate store, and it should be used to load correct certificate in PowerShell script. 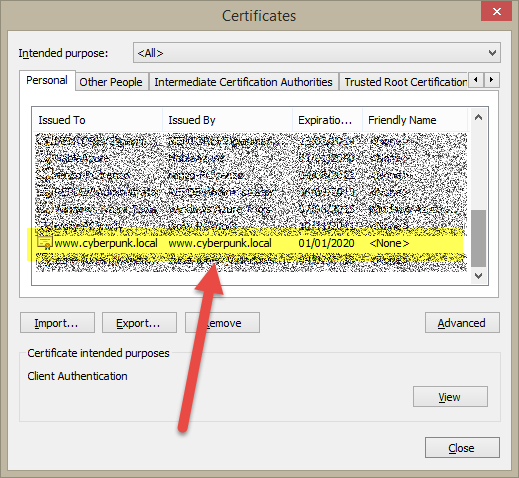 Figure 2: Grab the Thumbprint of the certificate in detail pane. You should grab the thumbprint from the certificate details, it should be a string like: f02e4c0e13e26d25065cc0db1d03450acaef90d6. Just copy from the details pane, remove all the spaces and you are ready to use this certificate to Encrypt and Decrpyt a string. Here is the PowerShell script that uses this certificate to Encrypt and then Decrypt a string. As you can see using the certificate is straightforward, you just grab a reference to certificate with the Get-Item using the thumbprint and then it is just a matter of calling Encrypt method of the public key object stored inside the certificate and convert to Base64 to be conveniently represented as a string. To decrypt you can call Decrypt method of the Private Key object. If you does not know how a RSA key pair works, here is the basic concept. The certificate contains two keys, one is the Public Key, and the other is the Private Key. You use the public key to encrypt a string and the resulting encrypted string can be decrypted only by the Private Key. Public key used to encrypt the string cannot be used to decrypt it. This is the reason why RSA is called an Asymmetric Algorithm. 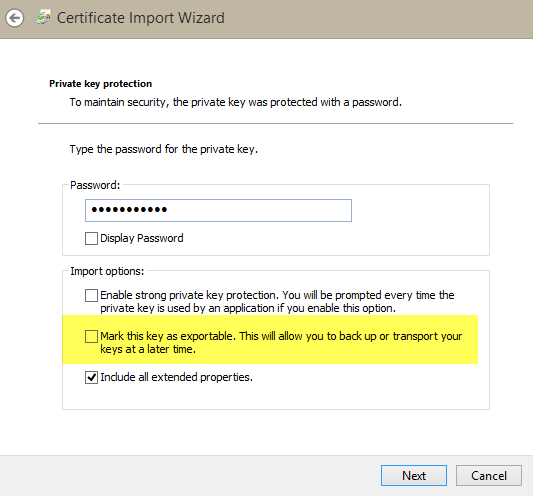 Now return to the Certificate manager, and press “Export” button to export the certificate, choose to export only the public key, choose DER format and export the certificate to a folder of your computer. Then press “Export” again but now choose to export the private key, choose the PKCS format and then use a password to protect the exported file. A password is required because the private key is the information that you need to keep secure from the eyes of the public. Now you should have two exported files, one with .cer extension that contains only the public key, the other with .pfx extension containing also the private key. Figure 3: Exported certificates in my filesystem. Now remove the certificate from Certificate Manager, and try to run again the script to encrypt and decrypt the string, you should now receive an error from Get-Item, telling you that the required path does not exists. This confirms that the certificate was removed from your certificate store. Now press the “import” button on Certificate Manager and import the previously exported public key, the file public.cer in my example and run the script again to verify that you are able to encrypt a string but you cannot decrypt, because you have only the public key. Figure 4: Now that you have only the public key, you are able only to encrypt and you could not decrypt anymore the string. To verify that you can decrypt password using Private Key, press Import button again on the Certificate Store and import the Private.pfx certificate. You will be prompted to enter the password you use during the export, and if you look at the options you can verify that there is an important option called “mark this key as exportable”, that is turned off by default. This option is really important, because this prevents users to further export the private key to another computer. Once you imported the Private certificate, you can verify that pressing the Export button does not permit you to choose the option to export the Private Key. Once the certificate with private key is imported you are now able to decrypt the password. Thanks to asymmetric key you can simply store the certificate with the public key in any network share, everyone can access the certificate, install it and securely encrypt a password because only people with the private key can decrypt it. Now you should login in every Build Machine with credential of TfsBuild, and import the certificate with the Private key to personal certificate store, do not mark the key as exportable. Now you can use Certificates instead of DPAPI to encrypt and decrypt password during the build. This script will work in every build server where you have installed the certificate for the user TfsBuidl. Here is the script. This script simply decrypt the password and call a simple REST service just to verify that the password was decrypted with success. Here is the output of the build. I want to remember again that this technique does not secure the password for people that can schedule a new build in TFS. Any person that can schedule a new build can create a PowerShell script that decrypt a password and print it in build output, grab an encrypted password from another build definition and let this script decrypt it. This is the same technique I used with the above script where I dump the password in clear format in Build output, just to verify that decryption is ok. Any other user with permission to schedule a build could have scheduled a build running a similar script to decrypt password store by other people. 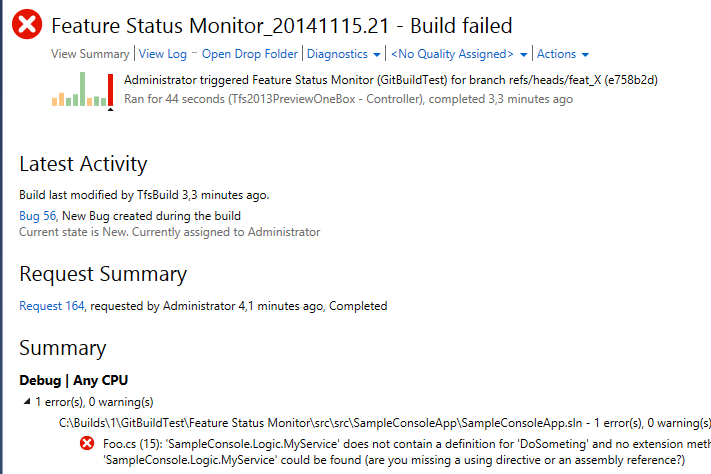 If you have a TFS Builds that fails with an error like this one, even if you have installed Visual Studio 2013 on your build server. The reason could be that you miss Sql Server Data Tools, you only need to download them in all servers with Build Agents and install it. Now the build should runs without problems. How can I store some PowerShell modules “somewhere” and have them available for all Build Agents? This is a real good question, but sadly enough it has no out-of-the-box answer. Luckily enough you can solve this with a little bit of PowerShell knowledge. Please be aware that this solution is based on some assumption on how TFS build actually works and is not guaranteed to be stable in the future, but I’d like to share with you all if you want to try into your environment. 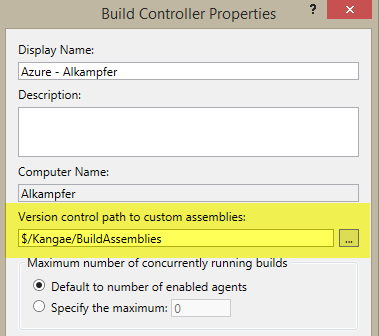 TFS Build controllers have a special Source Control Folder you can specify to store assemblies that should be available for Agents during the build. The very first step is creating a subfolder where you store all PowerShell modules you want to be available to Build Agents during a build. This special folder is downloaded for every agent during a build and it is stored inside a specific subfolder of the temp folder of the user configured to run build agents. 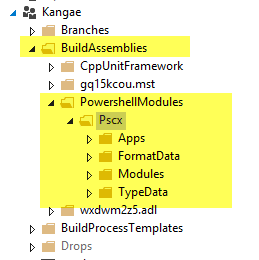 Once all modules are committed, it is just a matter of writing a bunch of PowerShell lines of code to identify the directory where that modules are downloaded during the build, and then copy all modules inside one of the default location supported by the PowerShell engine. $tempBuildDirectory = $env:Temp + "\BuildAgent\" + $agentNumber + "\Assemblies\"
Agent’s id is also used to create a separate local build folder for each agent, the first step is to store folder location where the executing script is located in variable $scriptRoot. The value is something like: C:\Builds\290\Experiments\Simple Powershell Versioning\src\BuildScripts. As you can see, id of the Agent is the first number that appears in folder structure, and extracting it with a simple regex is really straightforward. Final step is locating all the paths where PowerShell is actually searching for modules. All locations are stored inside the Environment variable $env:PSModulePath, containing a semicolon separated list of default folders for modules. The script cannot write to all of these folders because some of them are stored in path of disk that requires elevated permission (Es: C:\ProgramFiles). Usually one of them is located under Document folder of the current user: ? ?%UserProfile%\Documents\WindowsPowerShell\Modules, and since it is in user folder build agent can write on it without problem. Thanks to this knowledge I’ve decided to split the path to find the one that contains the path Documents. I know that this can be a fragile assumption, but it usually works. The last step is determine $tempBuildDirectory combining temp folder with agent id and finally use a Copy-Item cmdlets to copy all custom PowerShell modules inside the supported module location under agent user directory. Figure 3: Download your custom PowerShell modules in a know location as part of the build workspace. since I’ve stored build scripts inside $Experiments/trunk/Builds/ScriptTest/BuildScripts folder, I can use relative path to find location of PowershellModules on disk and import modules from specific locations. Sadly enough this solution does not works with Git repository and copying the modules with the above technique can be a viable solution.